The brain is a highly complex organ made up of billions of cells called neurons. Neurons send and receive messages to and from all parts of your body. These messages are electrical impulses that create brain waves. The brain map is an important tool we use to evaluate your brainwaves and identify opportunities to improve communication between various regions of the brain. The brain map is able to capture a window of brain activity, analyze the data, and create a visual representation for each lobe of the brain and each specific brain wave (Delta, Theta, Alpha, Beta). Using a cap placed on the scalp, our software captures the electrical impulses in the brain. This method is known as an electroencephalogram (EEG). The results show brain wave patterns in different parts of the brain. The process takes about 15 minutes, and the data is then converted into a visual brain map report. 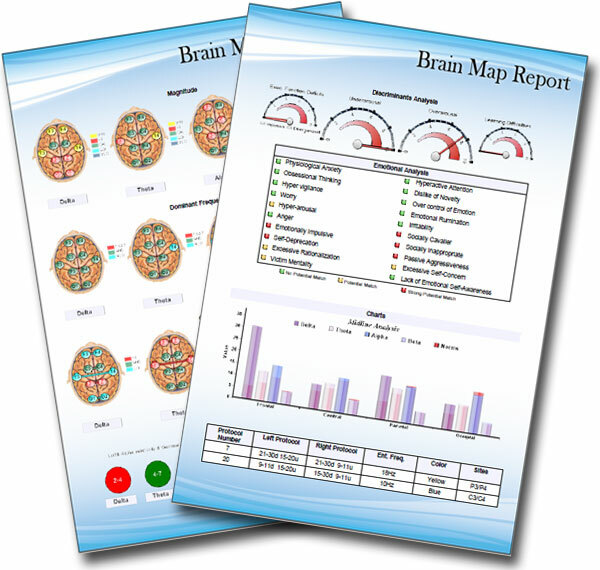 A clinician analyzes the brain map report and identifies any problem areas. The report displays the results in a clear and concise format that the end user can easily understand. Here is an example of the brain map report that is generated automatically (see below). The detailed report shows the analysis of each lobe of the brain (frontal, parietal, temporal and occipital) for each type of brain wave (Delta, Theta, Alpha, Beta). Also included is an analysis page, which indicates the presence of a particular symptom. At the bottom is a suggested protocol for training the patient’s brain back into normal ranges. This comprehensive report provides everything you need to understand the problem areas of your brain and how to start addressing them.